Berlin’s real estate market is the most active in Europe. The number of people living here is growing by about 40,000 every year. Mostly they are young professionals who look for a new job here. In 2016, Berlin’s GDP increased by 4.6%, exceeding the German average by 1.3 percentage points. Economic growth and an increasing population are accelerating property demand and prices of real estate in Berlin. From 2011 to 2016, the average residential real estate price in Berlin doubled to €4,136/m². The average monthly rental rate increased by 70% over the same period to €11.24/m². There are 12 boroughs, made up of 96 localities in Berlin. They call Lichtenberg a Little Berlin. it grows faster than other districts. Its population is foreseen to grow by 10% in next 15 years. Real estate prices increased by 40% between 2007 and 2016. Today, square metre in Lichtenberg costs €4,015, while the rental rate is €10.29/m² per month. Marzahn-Hellersdorf seems to be the most Russian-speaking borough of the German capital. Marzahn is the least expensive locality to rent an apartment in the city, it costs about €8.01/m² per month. Selling prices, at €3,316/m², is also one of the lowest in Berlin. The most central district, Mitte is the most expensive as well. Average property price is €6,757/m², while the rental rates run at €15.75/m² per month. It is the cultural and commercial heart of the city, with Bundestag, Bundesrat, foreign embassies and the tourist localities of Alexanderplatz, Potsdamer Platz and the Hackesche Höfe located there. Over a quarter of the locals in Neukölln are immigrants. Real estate here cost €3,558/m², which is a bit cheaper than in most other boroughs, while the rental rate is €11.25/m². This market is extending actively. The district is highly popular among young dwellers. Pankow is the most inhabited district of Berlin. Property prices differ significantly within its borders: they are as higher as closer to the Berlin’s centre. 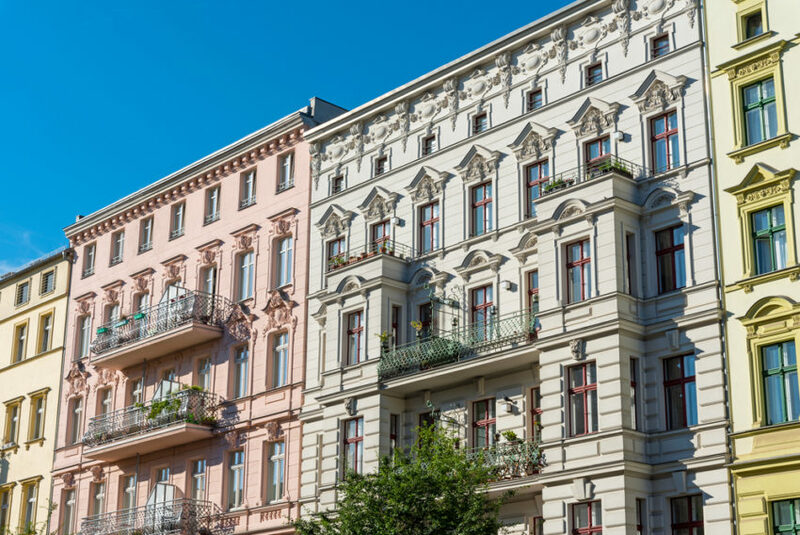 In Prenzlauer Berg real estate costs €5,006/m² , while further it decreases to €4,146/m². There is a similar trend between the rental rates: from €13.13/m² to €10.39/m² per month. Reinickendorf is located on Berlin’s outskirts. Prices there are cheaper there than in most other boroughs. The average price per square metre is €3,344, while rentals run at €10.33/m². In 2016, apartment prices in Reinickendorf skyrocketed by 29%, outpacing other city boroughs. The borderline district of Treptow-Köpenick is the least populated in the city. Rental rates in Treptow, the closest locality to the centre, run at €11.34/m², while farther east in Köpenick, they are about €8.92/m². The borough boasts of a huge park stretching alongside the Spree River. Tempelhof-Schöneberg fits every taste: it consists of old buildings for middle-class buyers, townhouses closer to the center and high-risers on the boundaries of the borough. Apartments there go for €4,795/m², and rentals average €12.11/m². Berlin is a great city to invest and to live in. Families with children will find safe boroughs with a lot of parks and good schools as Charlottenburg and Wilmersdorf, while young people will find home at Mitte or Tiergarten with many boutiques, cafes, bars and nightclubs there.